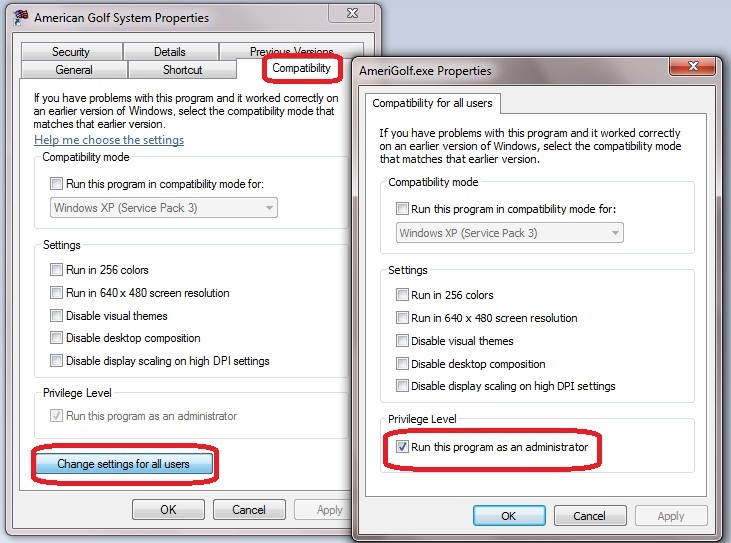 How to set the American Golf System to "Run as Administrator"
On some networked systems or systems configured for security purposes, you may receive a message the American Golf System needs to be set to "Run as Administrator". It is possible to do this each time you run the program by RIGHT-CLICKING the icon and selecting the option every time you start the program. However, it is extremely easy to set this up to happen automatically. This procedure will ONLY effect the American Golf System and not any other security settings on your computer. 2) Select the "Compatibility" tab (noted in red below). 3) Click the "Change Settings for All Users" button (also noted in red below). 4) Check the "Run this program as an administrator" and click Apply. That's it!